Healing from the Inside-Out - Return to balance, alignment and well-being. L O C A T I O N - Join us in the gentle rolling hills, expansive landscape and clean air of the Kettle Moraine countryside of southeasterrn Wisconsin. 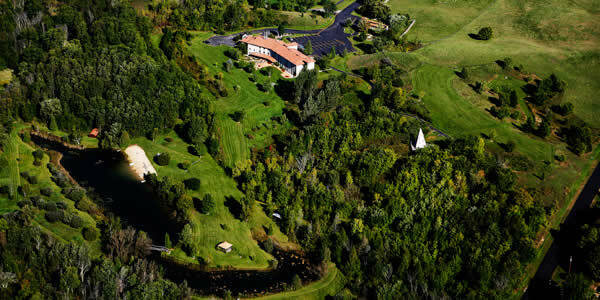 This heart-warming Retreat Center is set amidst the patterned fields of our Heartland's farmland. Think vast spaces of earth and sky, green green green and serenity. Even the drive to the center is calming, a relief from the hubbub of a city for me. Stars seem to pop out from a clear, dark night sky. With 100 acres of trails, an outdoor labyrinth, a beach and pond for swimming and nearby spots of interest to explore on our time off - this location is ideal. June dates give us an opportunity to enjoy a Midwestern almost-summer solstice glow and the aura of summer vacation. We are excited! Ideal location for our Residential. L E A R N I N G - The rhythms, sounds, sights and fresh air of nature has a healing effect. Hundreds of scientific studies have documented it! Nature helps us to simply "be", allowing intuitive responses and a sense of well-being to arise. We'll expand, clarify and deepen skills - in sensing, listening to, engaging the body's healing power, self-corrective responses, and more - with fellow Ortho-Bionomy enthusiasts. This Heartland Residential is for immersing ourselves in Ortho-Bionomy beyond technique. Free of the distractions and busy-busy of our lives, we will have flexibility in class timing and content, opportunity for creative play, and will take time to enjoy our surroundings and the local area. We'll explore and play, integrating how we move through the phases and the various classes. We'll hone how we tune in and assess where work is most needed. We'll experiment with the reflexes and the self-care practice of this healing art. Creative, new ways of applying the principles arise as we explore "meeting the person where they are." Ann will share some of her latest favorites, and new developments. We'll all share our success stories, laugh and play. E M P O W E R I N G - This Residential is also designed to empower participants by creating a safe and supportive environment for gaining a deeper awareness, understanding and appreciation of "self" and human nature. We'll reflect on universal principles as applied to physical, emotional, mental and spiritual aspects of ourselves and our lives. Simple science-backed practices support being in "flow" and build confidence. Creatively applying these principles and tried-and-true practices in our everyday lives not only takes our practice and business to the next level, it takes each of us to a deeper appreciation of "who we really are," as Arthur would say. Simple principles, simple practices, liberating results. How well we know that being more centered and comfortable within ourselves transforms everything. Y O U shine. You R O C K ! All I N C L U S I V E - Meals, lodging, course materials, 40 CE hours/units training and fun! Meet for dinner Sunday evening. Depart after lunch Saturday. - 7 days / 6 nights. - Solo or shared room - your choice, shared room has 2 queen beds - all have private bathrooms. - One dinner during our time off when we're exploring the area, will be on our own. - Fresh tea and coffee available throughout the day and evening; refrigerators on-site. - Tuition and class materials. - 40 Ortho-Bionomy® Residential units | 40 NCTMB CE hours. - Bonfire anyone? Labyrinth walk. Trails. Beach and pond. Unique local sites to visit. - Payment options, see below. *Dietary requests must be submitted at least 3 weeks before class. We'll need massage tables, face cradles and bolsters, table sheets and face cradle covers, notepaper and pen. Please indicate if you can or cannot bring a table. CHECK If all payments are made by check there is a $50 discount. Mail checks payable to The Sun Center, 1818 N. Wells Street, Chicago, IL 60614. PAYPAL CREDIT offers an option to use their money for 6 months and pay $0 fees and $0 interest IF you pay off the balance within 6 months. One idea is to set up a monthly auto pay or repeating payment with your bank online so there's nothing to manage. Get the details and apply through Paypal blue link above. REGISTER ONLINE below, using links with options to pay deposit or full balance and choose solo room. OTHER PAYMENT OPTIONS may be arranged with The Sun Center, call 312-280-1070. Reserve your place with a $250 deposit and tell us your choice of shared or solo room. Your registration indicates agreement with cancellation and refund policies here. $250 deposit will hold your place. Contact us for help finding a roommate. Add $150 for solo room. + $1345 balance by 2/22/18 for shared room. Add $100 for registrations before 3/30/18. Add $200 for registrations after 3/30/18. Registration must be made by 5/18. The retreat center needs final numbers. REGISTER ONLINE Use the drop-down menu below. Select item desired, click "Add to Cart". Above "order summary" click "Continue shopping" to add-in balance, and Solo room option if you prefer to room alone. We anticipate having enough rooms for everyone to get their room choice. A D V A N C E D Instructor, Ann Hoeffel - web-link for the full list of Ann's training. Practicing Ortho-Bionomy since 1987, Basic Instructor since 1997, Advanced Instructor since 2006. Ann trained with founder, Arthur Lincoln Pauls (beginning in 1987) and many wonderful instructors. She also served as Vice President for the Society of Ortho-Bionomy International. With over 4800 hours in the field of wholistic health and healing and a BS in Education from the University of Wisconsin, Ann's passion for learning, teaching and helping others is well-founded in Ortho-Bionomy® and other therapies that help us awaken the healing powers within for health, joy and fulfillment. QUESTIONS? Email with subject RESIDENTIAL to suncenter@wholisticlifecenter.com OR call 312-280-1070. We'll get back to you as soon as we can. Convenient to Milwaukee (less expensive airlines may be Alliance and Southwest) and Chicago airports with easy access to inexpensive public transporation if needed. We will do our best to help with rides or carpooling for final door to door. Of course this requires advance planning so contact us if you need help with this. T R A V E L Info - info will be added to this page in tme to help people unfamiliar with the area. Please put RESIDENTIAL in the subject line so we don't miss it!